Are you in the process of looking for a fence company in Richmond to install a residential or commercial fence? If so, it’s important to know the right questions to ask. In this week’s blog, we’ll cover the questions you should ask concerning fence installation. The answers will give you a better understanding of how the company goes about the installation process, and whether or not they know what they’re doing. Will You Call a Utility Locator? This is very important. If a fence company is willing to start digging without calling a utility locator, this is a problem. Digging without knowing if there are any electric, water, or gas lines under the surface is just asking for trouble. Any reputable fence company will call a utility locator first to ensure it’s safe to dig. Installation of a residential or commercial fence in Richmond requires a permit. If a fence company does not secure the right permits, you could be looking at a fine from the local government. One of the reasons people choose a fence company to handle fence installation is to avoid having to deal with the permit process. If a fence company does not do this, you should start looking elsewhere. How Do You Deal With a Grade? Grade refers to slope of the lot. A steep slope can present a challenge to fence installation that only a professional will know how to deal with. Fences on a grade can either be contoured to the ground or stepped, which leaves some small space under the fence. Ask the contractor how they plan to deal with installing a fence over grade to make sure they know how to account for this situation. Is Other Hardware Included in the Cost? When the fence company gives you an estimate, are they including the cost of other hardware like the gates? If they don’t, you might be surprised when you get the final bill and find it’s jumped up from the original estimate. Make sure you know what you’re paying for in advance so there are no surprises when the bill comes. 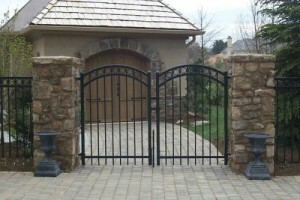 Do you need residential or commercial fence installation in Richmond? Talk to Hercules! Hercules Fence of Richmond has been providing professional fence installation and service in Richmond for more than 50 years. Call us at (804)752-7992 or contact us on our website to learn more about residential and commercial fencing in Richmond. This entry was posted on Friday, March 20th, 2015 at 3:06 pm. Both comments and pings are currently closed.